Animal totems have a significant impact on our lives. These totems can help you to discover yourself and give you a chance to be self-aware. They might assist in understanding the past and applying this knowledge to know how to improve your life. Totems are means of personal identity. They might help you throughout all of your life or come to you at a particular time of need. Many ancient cultures believe that animals have a strong connection to the spiritual world. Even now, the animal signs are being used all over the world, like this weasel animal totem. The meaning of the weasel totem varies in many cultures. In the Greek culture, the weasel is seen as an omen of bad luck, especially if a woman is getting married. The weasel is said to be an unhappy bride trapped in a body of a weasel, and bound to destroy the wedding. In Native American astrology, a weasel is seen as a bad sign. It symbolizes being sneaky, conniving, misleading. Also in Japanese culture, the scream of the weasel is considered to bring misfortune. In Macedonia and France, the weasel is an omen of good fortune and is not to be killed. The Weasel animal symbols have small, slender body, and, although they might seem really cute, they are actually vicious predators. Nevertheless, they are cheerful and playful. The slim body of the weasel helps them to chase their prey into burrows. They are quick when it comes to taking an opportunity. They take advantage of everything they can drag to a safe place. The cunning nature of the weasel shows us how to create a safe place for ourselves and stock it up with things you might need later on. It could be people, material things or random ideas, but a weasel will always have something hidden in its home. Their eyes point directly forward, and follow their noses. People who have weasels as a totem are highly focused on what is in front of them. These people stay focused on their goals. These animals have a symbolic link to the underworld. Their keen sense of smell and ability to see in the dark is what links them to the secrets of darkness and creation. Weasels have very accurate senses and keen intuition. They look through things, and one can never hide anything from them. 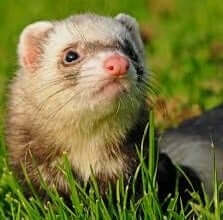 If your animal totem is a weasel, it can help you to improve your senses and guide you in the right direction. If you don’t develop your sensibilities, your mind can get stuck in a box – you are capable of a lot of focus but don’t lose the ability to see clearly around you. Having a flexible mind will improve your life and lessen anxiety and unnecessary fears. You can afford to have a light attitude towards dangerous things. Your playfulness and joy will bring you success. Weasels are extremely fast in maneuvering. Their slender body helps them to do so. If this is your power animal, it teaches you to be quick when trying to avoid danger. You always have to have your safe place where to rejuvenate. You will feel comfortable if you have a place where to escape if you feel threatened. In nature, these animals produce a scent, if under attack, and the hair of the tail gets prominent. This is meant to scare off the predator, but it might not work so well. Therefore the weasel is better of running and hiding in their cave. This also symbolizes your need for more security in your life. The weasel animal symbol is a powerful and complicated totem. It can help you in uncovering hidden secrets, even the ones within you. It can help you bring out some of life’s mysteries to the surface. Weasel people are powerful allies to have. You have the capabilities of seeing what others do, especially when it comes to competition. You might use a bit unethical methods, but in the meantime look innocent – that’s why people usually don’t catch you in action. It is also true that people do underestimate you. You are a loner, and enjoy observing thing from far, but you have high intelligence and capabilities. You can use this in your favor- let your opponents think you are weak; this is how you are going to get ahead of them. To see a weasel animal totem bent on a marauding expedition in your dreams, warns you to beware of the friendships of former enemies, as they will devour you at an inopportune time. If you destroy them, you will succeed in foiling deep schemes laid for your defeat. To see a weasel symbol in your dream signifies friendships and betrayal. This beautiful little animal is predatory, hence the meaning in your life. There might be some old friends or new acquaintances that seem friendly from the first sign but have bad intentions. This person is ready to tell you everything you want to ear, but later on, will stab you in the back. It is not worth believing this person or hoping for them to change. If weasel has shown you who that person is, be careful, if you try to trust them you might get hurt and carry a feeling of mistrust and stupidity with you. It may also signify your general distrust towards others. Alternatively, a weasel totem in your dream might also signify that you have been dishonest and ambitious. This attitude may repulse other people and deny you opportunities to benefit. Although it is sometimes necessary to use your cunning nature, be sure not to hurt other people by doing so. A white weasel in your dreams is a warning for your pets. They might have some health issues, or it can also foresee a death of an animal. A grey weasel or one with spots on its fur signifies the need for white lies in your life. In your career, this signifies taking extraordinary actions that might seem a bit unethical. In your personal life, it means achieving your personal goals with kindness and empathy. Try changing your tactics, and use a little bit the cunning nature of a weasel. If a weasel is licking your face in your dream, this means you are going to get a new and great friend. This new person probably is in need for support, but you will be significantly awarded afterward for your patience and empathy towards them. If the animal is attacking you, it may foresee a conflict. You must not get into this conflict, because it might last for a very long time. It is best if you deal with the problem calmly and don´t respond to provocation. The weasel animal totem has many qualities and fascinating nature. Despite its small body, they have a lot of capabilities. Learn from the nature of weasel – it has good looks and fun nature, in the meantime, it still is a predator. They are to be trusted, and they can make a good friend – for example, the very popular ferrets are also from the weasel species. Cute, smart and loving, but they will not hesitate to steal from your plate. Keep that in mind when meeting a weasel. Previous What Is Xuan Kong Feng Shui?